"Ocean Haze” is a semi-oceanfront condo at Sandbridge Dunes Condos. High end furnishings, an oversized floor plan with over 2000 square feet and beautiful décor complement the fabulous ocean views from the great room, kitchen and master bedroom. Little ones are welcome with a queen bedroom outfitted with a toddler bed, and another toddler bed is in the king master bedroom for families with little ones that need to stay close. "Ocean Haze” is really a room with a view! If you can tear yourself away from the ocean views on the balcony (complete with privacy walls on BOTH sides) you can enjoy the game or a movie with the cutting edge Home Theatre System with 65” 4K HDTV, and PlayStation 4/Blu-ray . Tasteful quality is evident throughout the condo, with 9 foot ceilings, granite countertops in kitchen and bath areas, decorative tile in the king master bath, and ceramic tile in the kitchen and baths. All bedrooms have smart TV's and USB charging stations. Relax on the balcony with your morning coffee or evening drink, read or just soak up the view in several areas of the unit: king master reading nook, the great room window seat chaise, or of course…the balcony! An electric grill is provided for you to enjoy grilling on your balcony if you please, or enjoy cooking in the well-stocked kitchen, including a Keurig coffee maker. There are grab bars for safety in both bathroom toilet areas and the whirlpool tub in the master bathroom. "Ocean Haze” comes with two parking spaces, both end spaces. Everyone will enjoy the easy access, from the ground level elevator to the third floor where the unit itself is all one level. The convenient location will make mini-trips to the store just a walk across the street to Sandbridge Market for milk, eggs, and an assortment of kid and adult beverages. There are a couple of restaurants close enough to walk to (open summer season) and ice cream and a bit of souvenir shopping is across the street too! The beach access directly across from the condo is lifeguarded (Memorial Day through Labor Day). Enjoy community amenities that include community pool, kiddie pool area, and fitness room. One Level on the Third Floor: Great room with 65 Inch 4K HDTV, PlayStation 4 Blu-ray, Home Theatre Surround Sound, Balcony Access, Kitchen with Granite, Keurig Coffee Maker, Bar seats 2, Dining Table seats 8, Hall Bathroom with a tub/shower combo, Laundry, King Master with Smart TV, Access to Balcony, Ocean View, Toddler Bed in Closet, Whirlpool with separate Shower, Double Sink Vanity, and separate toilet closet; Queen Bedroom with Toddler Bed and Smart TV; Queen Bedroom with Smart TV. 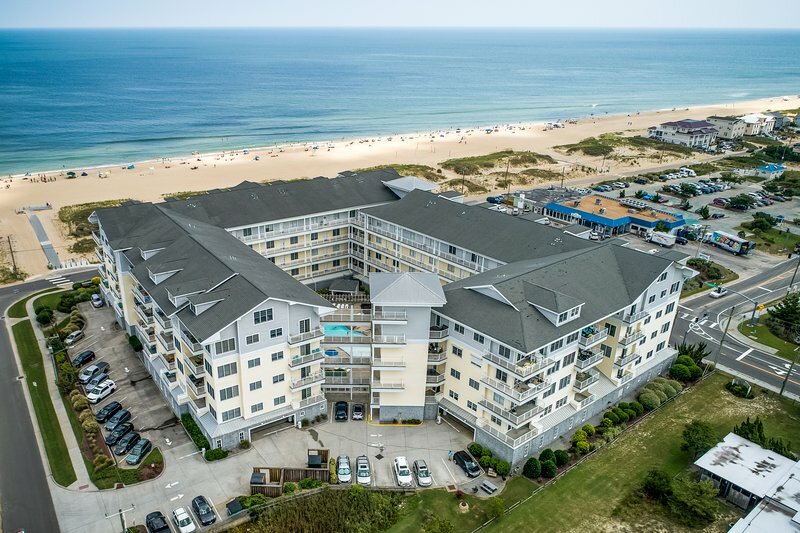 Extras: Wireless Internet Access, Blu Ray player, PlayStation, No Smoking, PETS NOT ALLOWED, Parking: 2 Cars, Distance to the Beach: 100 ft.
"Ocean Haze” is a semi-oceanfront condo at Sandbridge Dunes Condos. High end furnishings, an oversized floor plan with over 2000 square feet and beautiful décor complement the fabulous ocean views from the great room, kitchen and master bedroom. Little ones are welcome with a queen bedroom outfitted with a toddler bed, and another toddler bed is in the king master bedroom for families with little ones that need to stay close. "Ocean Haze” is really a room with a view! If you can tear yourself away from the ocean views on the balcony (complete with privacy walls on BOTH sides) you can enjoy the game or a movie with the cutting edge Home Theatre System with 65” 4K HDTV, and PlayStation 4/Blu-ray . Tasteful quality is evident throughout the condo, with 9 foot ceilings, granite countertops in kitchen and bath areas, decorative tile in the king master bath, and ceramic tile in the kitchen and baths. All bedrooms have smart TV's and USB charging stations. Relax on the balcony with your morning coffee or evening drink, read or just soak up the view in several areas of the unit: king master reading nook, the great room window seat chaise, or of course…the balcony! An electric grill is provided for you to enjoy grilling on your balcony if you please, or enjoy cooking in the well-stocked kitchen, including a Keurig coffee maker. There are grab bars for safety in both bathroom toilet areas and the whirlpool tub in the master bathroom. "Ocean Haze” comes with two parking spaces, both end spaces. Everyone will enjoy the easy access, from the ground level elevator to the third floor where the unit itself is all one level. The convenient location will make mini-trips to the store just a walk across the street to Sandbridge Market for milk, eggs, and an assortment of kid and adult beverages. There are a couple of restaurants close enough to walk to (open summer season) and ice cream and a bit of souvenir shopping is across the street too! The beach access directly across from the condo is lifeguarded (Memorial Day through Labor Day). Enjoy community amenities that include community pool, kiddie pool area, and fitness room. One Level on the Third Floor: Great room with 65 Inch 4K HDTV, PlayStation 4 Blu-ray, Home Theatre Surround Sound, Balcony Access, Kitchen with Granite, Keurig Coffee Maker, Bar seats 2, Dining Table seats 8, Hall Bathroom with a tub/shower combo, Laundry, King Master with Smart TV, Access to Balcony, Ocean View, Toddler Bed in Closet, Whirlpool with separate Shower, Double Sink Vanity, and separate toilet closet; Queen Bedroom with Toddler Bed and Smart TV; Queen Bedroom with Smart TV. Extras: Wireless Internet Access, Blu Ray player, PlayStation, No Smoking, PETS NOT ALLOWED, Parking: 2 Cars, Distance to the Beach: 100 ft. Community Extras: Community Pool, Kiddie Pool, Fitness Room, Community Grilling Stations, Garage Storage Unit, Covered Garage Parking Additional amenity details: The community pool opens May 1 and closes October 1. The opening and closing dates for the pool are subject to change based upon mitigating circumstances such as weather. The pool will not open before May 1st and may close before October 1, but if the fall weather is suitable, the pool may stay open as late as mid-October. All Sandbridge Blue properties provide bed linens, bath towels, beds made prior to your arrival, and a starter supply of: toilet paper, bathroom soap, paper towels, and dishwater detergent.